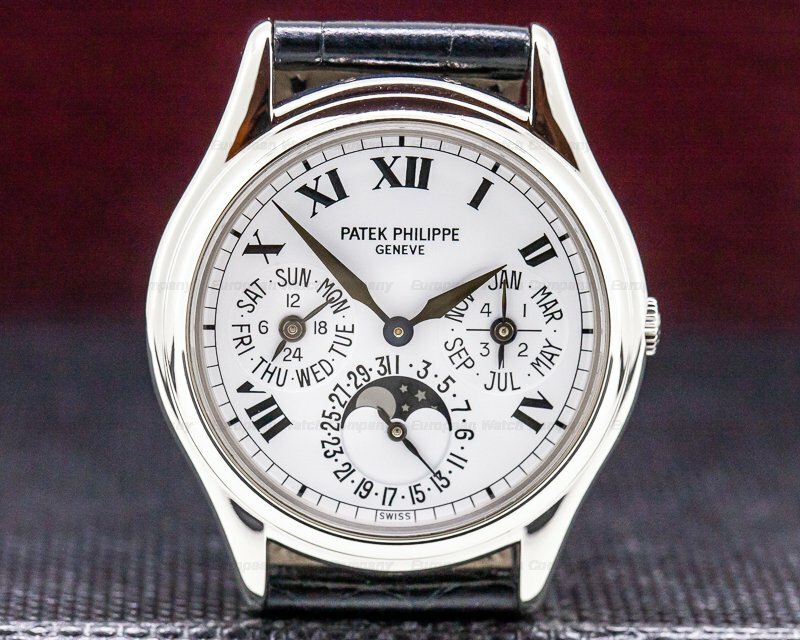 30669 Patek Philippe 5135 G Gondolo Calendario, 5135G-010, 5135G, 18K white gold on a strap with an 18K white gold tang buckle, automatic Patek Philippe caliber 324 S QA LU 24H movement, annual calendar, day, date, month windows, moonphases, am/pm Indication, centered sweep seconds hand, grey ardoise dial with applied white gold indicators, display back, sapphire crystal, water resistant to 25 meters, size: 39mm x 39mm, thickness: 11mm, Like New with box and papers dated 7/2010. 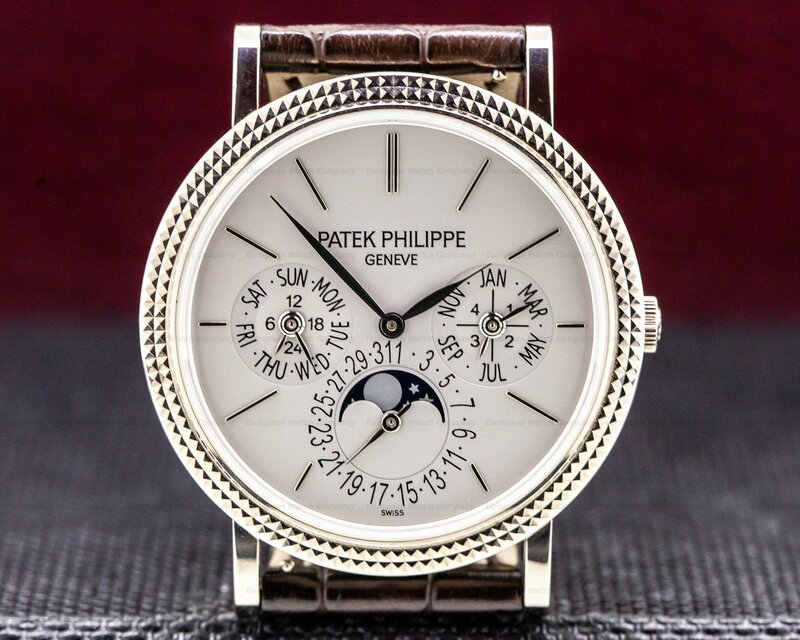 This is an 18K white gold Patek Philippe Gondolo Calendario 5135G-010. 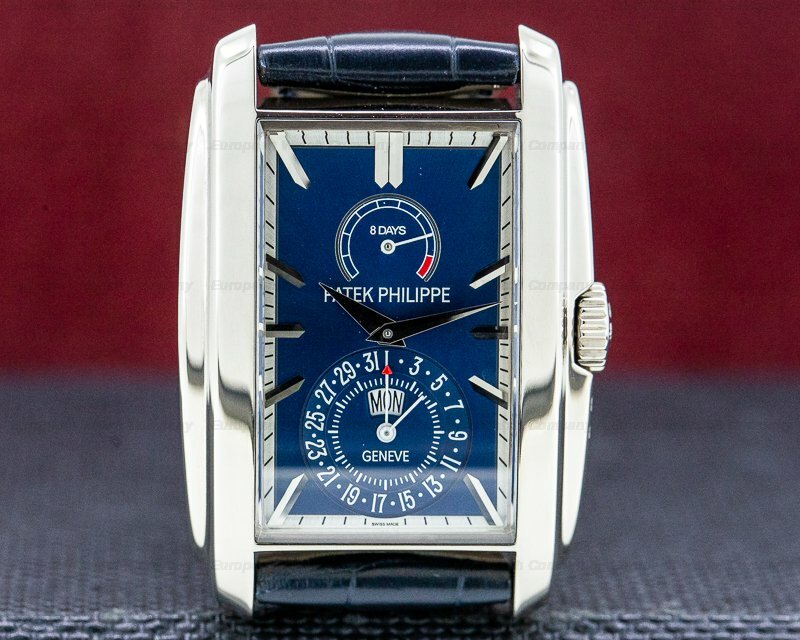 It has a distinctive tonneau-shaped, Art Deco style with stepped, rounded bezel and curved lugs. 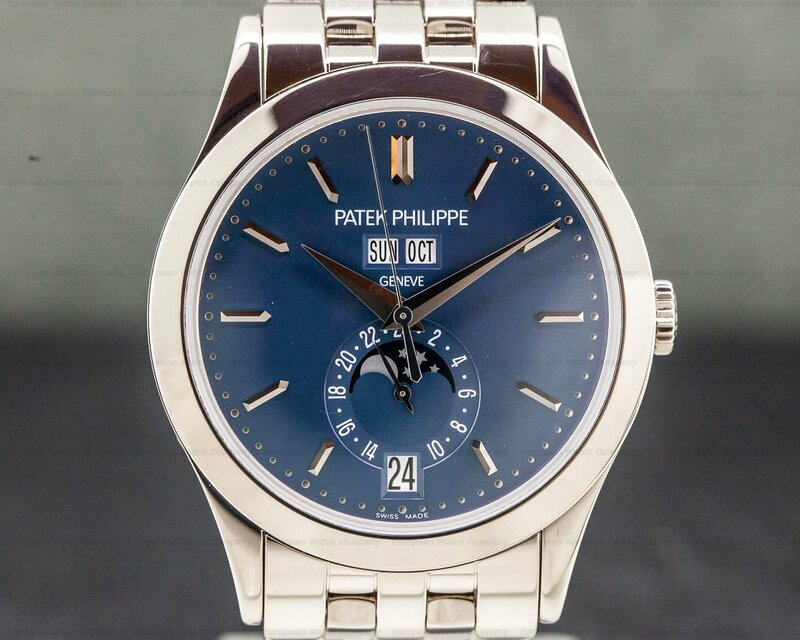 It has a grey ardoise dial with white gold dauphin hands and dart hour markers, with Arabic numerals at 9 and 3. There is a sweep seconds hand with a concentric marker circle. 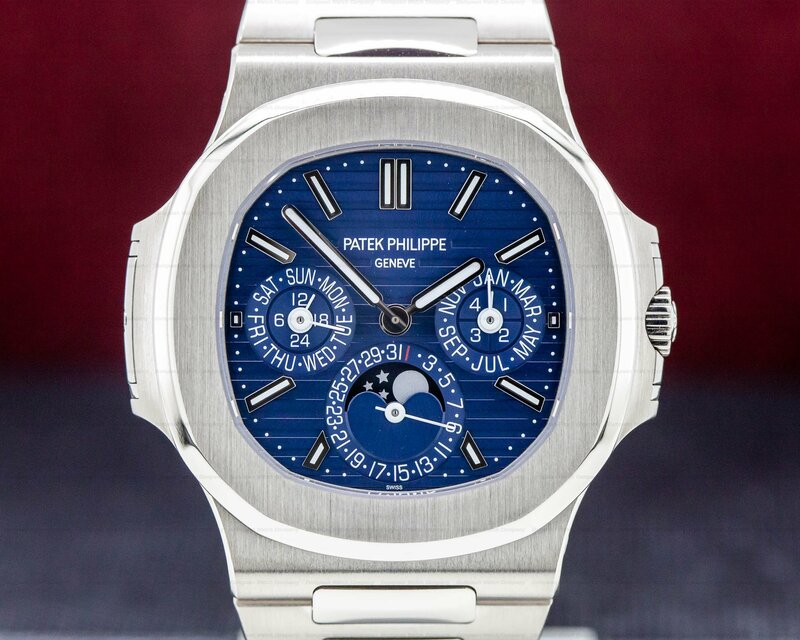 The annual calendar complication has day, date, and month aperture windows at 10 o'clock, 12, and 2 respectively. 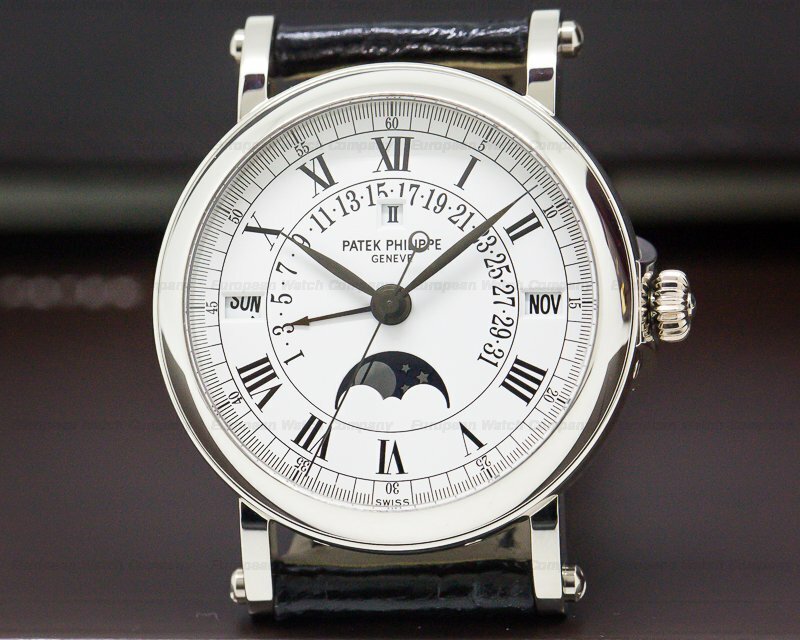 The moon phase sub dial and am/pm indicator are at 6 o'clock. It's water resistant to 25 meters. The solid, two-body, polished case has a sapphire crystal, screw down display case back. The leather strap has a matching 18K white gold buckle. This self-winding caliber 324/205 movement is rhodium plated with fausses cotes embellishment and the quality stamp of the Seal of Geneva. 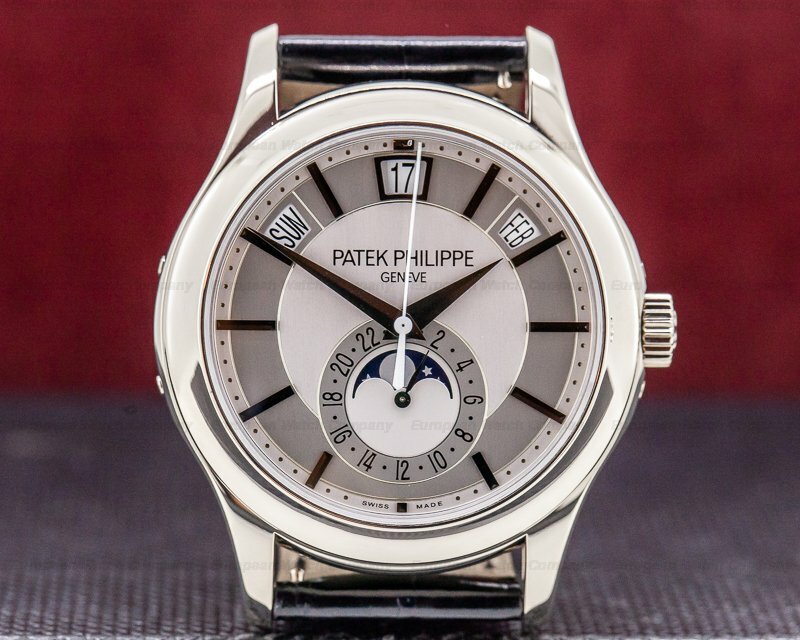 It was constructed with 34 jewels and a straight-line lever escapement. It has a shock absorber mechanism, a 21K gold rotor, and a self-compensating free-sprung flat balance spring. 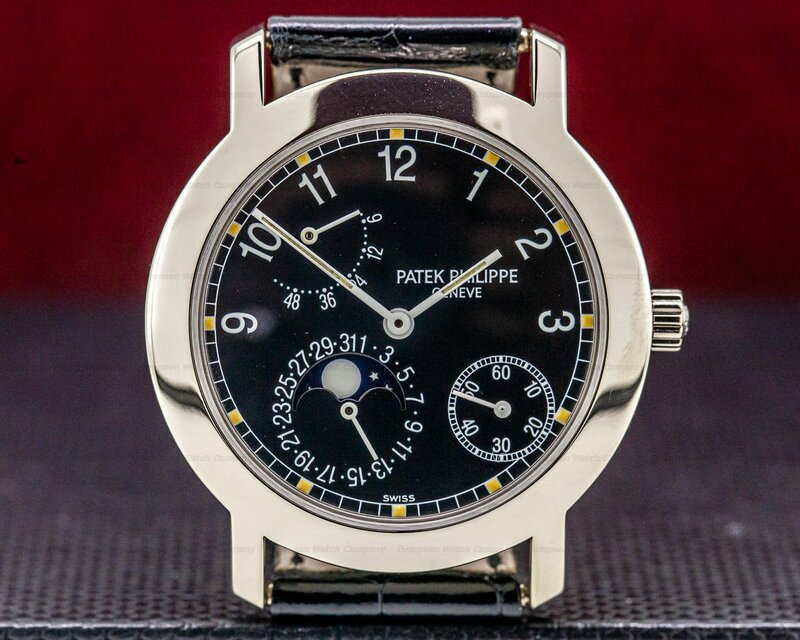 There is also the patented Patek Philippe Gyromax balance that compensates for cold, heat, isochronism, and 5 positions. The case, dial, and movement are all signed. 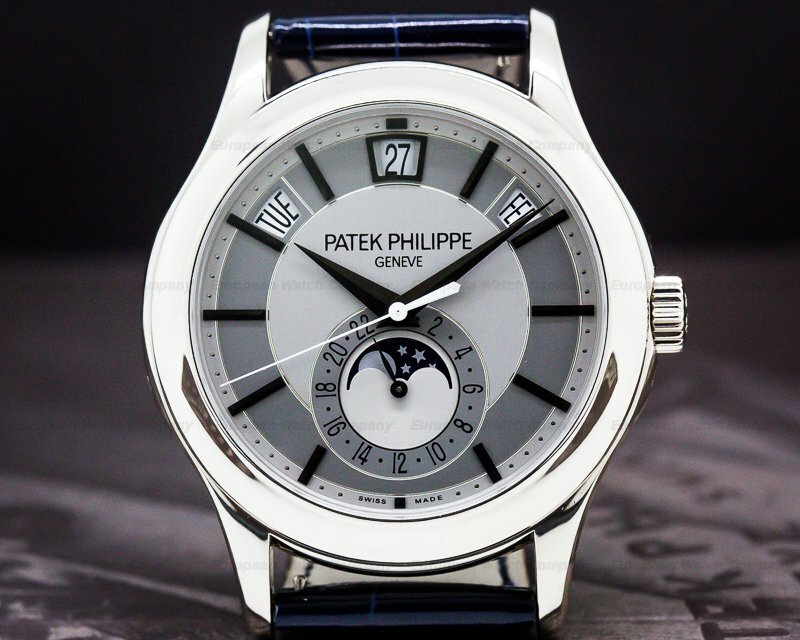 Patek Philippe launched the distinctive, art deco-inspired Gondolo line in 1993 with their reference 4824. 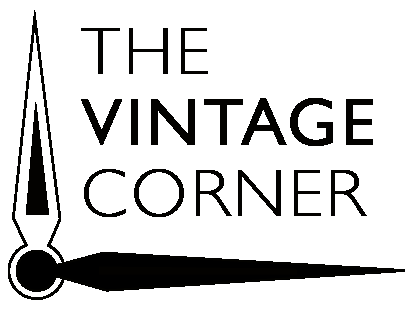 This collection is a contemporary re-examination of the stepped, stylistic lines of the 1920's art movement that so influenced industrial design. 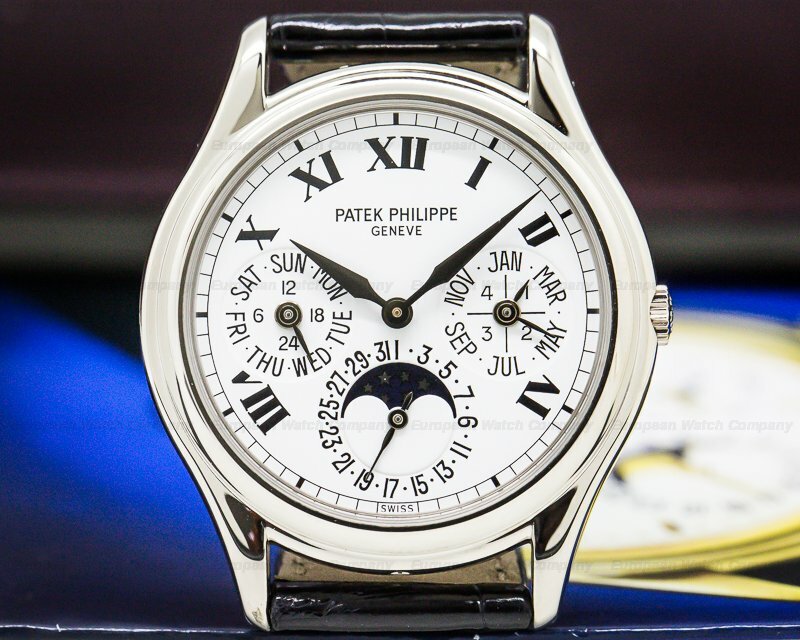 The line is named for the "Chronometro Gondolo" pocket watches created by Patek for the Brazilian Gondolo & Labouriau jewelers in Rio de Janeiro in 1902. The company patented the first annual calendar indicator in 1996.